In 1986, Nintendo and Fuji TV worked together on cross-media promotions, such as All Night Nippon Super Mario Bros. In 1987, Fuji TV hosted the Dream Factory Communication Carnival event, where they showcased their latest TV shows and products in Tokyo and Osaka. To coincide with the event, the team that developed Super Mario Bros. created Dream Factory: Dokidoki Panic, starring the four mascots of the 1987 Fuji TV Dream Factory event, Imajin, Lina, Mama and Papa. 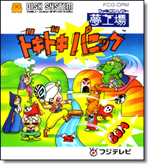 Dokidoki Panic is better known as the game that later became Super Mario Bros. 2 outside of Japan. In the Dream World of Muu, the happy Muu people lived peaceful lives. In this strange land, the weather is decided by the "dream of the day": If everyone has a nice dream, then the weather is bright and sunny, but if everyone has a bad dream then the next day there will be storms. The Muu people invented the Dream Machine, so they could always have good dreams and good weather, but a mischievous monster named Mamu changed the machine to produce monsters. However, Mamu was weak to vegetables and hated them more than anything in the world. The Muu fought Mamu by hurling vegetables at him until he was buried. Mamu surrendered and peace was restored to the Dream World of Muu. Rusa the monkey found an old story book about the Dream World of Muu and gave it to the twins Piki and Poki. At first they read the story together, but they soon began to squabble over the book. They accidentally tore out the final page, and with a flash a monstrous hand appeared from the book and pulled the twins inside. Imajin, the twins' older brother, ran into the room just in time to see the hand vanish into the book. He called his sister Lina and his Mama and Papa to help, and together they jumped into the book. This explains why there are only 2 stages in the final Chapter, as the final part where Mamu surrendered was accidentally torn out by Piki & Poki. This fact was lost in the retold story in Super Mario Bros. 2. You have to select a character from Imajin, Lina, Mama or Papa. Each character has their own statistics for strength (affects speed of picking up items), speed and jump ability. Once you select a character, you will use that character until you clear a World or receive a Game Over. Each character's progress through the game is separate from the others, so if you reach World 3 with Imajin, and then change to Lina, you will start again from World 1. The player starts each stage with two blocks of life. You can stand on and pick up enemies and other objects in the game and throw them to defeat other enemies. Throughout the game you will see grass that can also be plucked from the ground, often revealing Vegetables or other items that can be used as weapons. If you find a Magic Potion, you can use it to create a door, revealing a shadow world where the grass becomes coins (used for an end-of-stage slot machine bonus game). If you throw it in the right spot, you can also find Hearts that increase your life bar for the duration of the level. The game is split into 7 Worlds: the first six worlds are split into three levels and the final world is split into two. At the end of each level is a Mask Gate that can be opened by collecting a Crystal. This Crystal is typically guarded by the egg-spitting monster, Catherine. On the final stage in each world, entering the Mask Gate takes you to the boss of that world. Each character's progress is saved when they reach the end of a world. If you receive a Game Over or quit the game, you return to the first stage of that world next time you play. If you clear the game with one character, you free the Muu from Mamu's prison. You need to clear the game with all four characters to receive the true ending. A strong boy who wears a turban. He is very much the centre of his family. While he has no particular strengths, he also has no particular weaknesses. Imajin's sister who wears a pink hat with a veil. What she lacks in strength and jumping ability she makes up for with her special ability to hover in the air for short periods. Imajin's mother who wears a long robe with a pointed hat. She is the highest jumper in the family, and while she isn't the strongest, she can throw objects pretty far. Imajin's father who also wears a turban, but is plump and sports facial hair. He is the worst jumper in the family, but he is incredibly strong, hardly having to slow down as he plucks vegetables and enemies from the ground. The twins, and the youngest children in Imajin's family. They were kidnapped by Mamu and are being held captive in the Muu World. Imajin, Lina, Mama and Papa must defeat Mamu and his monsters if they want to save them. Imajin's pet monkey who wears a green hat and jacket. He wrote the story of the Muu World for Piki and Poki, but managed to escape being sucked into the book. The residents of the Dream World of Muu are small, flying creatures. Each time one of the family defeats Mamu, they will free the Muu from their jar prison. A robed creature that wears a mask to cover its terrible face. They wander around the Muu World. The pink type wanders back and forth on a single platform while the red type will walk in a straight line off a platform. When the red type lands, it will turn to face the hero. Hey-Hos can also be seen riding Daucho and Turbomb. An elite Hey-Ho that wears a gas mask that can shoot bullets from the mouth. The pink type wanders back and forth, occasionally stopping to shoot bullets, while the grey type jumps up and down in one spot while shooting. A living cactus that lives in the deserts of Muu World. When its head is knocked off, one of its other body parts will become the head. There are four body parts in all. A little hedgehog that wanders around. The heroes are unable to stand on its back. A little devil that resembles a ninja. There are two types: one will run towards the hero, jumping occasionally, while the other will stand in one spot and jump up and down. A flower that spits fireballs. The red type stays in one spot and spits fireballs in an arc towards the hero, while the grey type only spits fireballs directly above it. The pink type spits fireballs like the red type, but it also walks around, chasing the hero. A flightless black bird with stubby wings. Because it can't fly, it rides around on a magic carpet, swooping at the hero. If you time it just right, you can throw Dodoriges off the magic carpet and ride it for a short while. Protector of the keys in Muu World. If the hero finds a key to a locked door, Kameen will appear and give chase by flying all around the screen. If you drop the key then Kameen floats away, but as soon as you pick it up again he will be back. A creature made of electricity who sticks to walls or platforms. The heroes are unable to touch them. Sparks can either move slow or fast. A red bird that flies through the skies of Muu World. They most often appear to drop Bobs on the hero, but from time to time you can hitch a ride on their backs to reach new areas. A little living bomb that walks around before exploding. Bobs are very dangerous, but they can also be used to break crumbling blocks or to defeat enemies. Beware, sometimes when you pull up some grass, you will find a Bob that will very quickly explode. A ladybug beetle that climbs on vines and trees. They climb slowly and descend quickly. Sometimes you can ride a Tapen all the way to the top of a tall vine. A little bird creature with bat wings that wears a Hey-Ho style mask. They hop around. A fish that leaps up and down waterfalls. 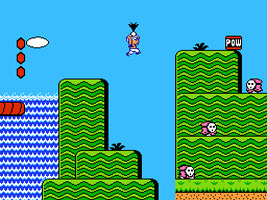 The heroes can use Totos as platforms to cross large waterfalls, although don't be carried off the bottom of the screen. A snake that lives in the deserts of Muu World. If they hide in the sand, they will jump out and chase after the hero, spitting bullets. If they hide in jars, they will jump in and out of the jar to spit bullets. A little snow creature that dashes back and forth on the ice, chasing the hero. Because they are so slippery, they often overshoot their mark and slide away. An ostrich ridden by a Hey-Ho. They run quite fast, but if you can throw the Hey-Ho off then you can ride Daucho yourself. A little Hey-Ho with wings that flies down from the sky and charges at the hero. It is difficult to stand on top of a Tondaria, but sometimes you can use them as stepping stones to reach new areas. A cannon on wheels, ridden by a Hey-Ho. They will chase the hero around, shooting fireballs. If the Hey-Ho is knocked off, then the hero can hitch a ride on the Turbomb. A lizard-like creature that spits eggs from its mouth. Despite its name and feminine appearance, Catherine is male. It appears at the end of most stages, guarding the crystal that opens the Mask Gate. Grab the eggs it spits and throw them back at it three times to defeat it. Pink Catherines spit eggs, red Catherines spit eggs and fireballs and grey Catherines spit only fireballs. A bomb-throwing mouse, and boss of Worlds 1, 3 and 5. The hero has to catch the bombs it throws and toss them back at him to defeat him. Each time you face him he becomes stronger and there are more obstacles in his lair. A three-headed snake, and boss of Worlds 2 and 6. It spits streams of fireballs. Throw three Mask Blocks back at it to defeat it. You can also use Mask Blocks to build a wall to block its fireballs. A living ball of flame, and boss of World 4. It drops fireballs as it swoops around its lair. When you hit it with three Mask Blocks it breaks apart into four small Hibobos that hop around on the ground. The Mask Gate appears at the end of each stage, but on the final level it breaks away from the wall and flies around the room. Hit it with three Mask Blocks to pass to the final challenge. The monster that changed the Dream Machine so it produced monsters, imprisoned the Muu and kidnapped Piki and Poki. He resembles a large frog in a robe and crown, and it hates vegetables more than anything. Grab the vegetables spat out by the Dream Machine and throw them into Mamu's mouth when it's open, avoiding the deadly bubbles he spits. When Nintendo launched Super Mario Bros. in 1985, they believed they had pushed the hardware as far as it could go. With the Japanese release of the Famicom Disk System in 1986, a sequel to Super Mario Bros. was released, reusing many of the sprites from the original game, but sharply increasing the difficulty level. In America, the decision had been taken not to release the Japanese Super Mario Bros. 2 (later dubbed The Lost Levels). However, with development of Super Mario Bros. 3 underway, Nintendo of America needed a game to fill the gap. Dokidoki Panic became the missing Mario sequel, and was released in the U.S. and Europe as Super Mario Bros. 2 in 1988 (the same month as Super Mario Bros. 3 was released in Japan). The four Dream Factory characters were swapped out for Mario, Luigi, Peach and Toad, and a number of alterations were made to the gameplay. The game was later repackaged as Super Mario USA and released in Japan in 1992, officially becoming a part of the Super Mario series internationally. Dokidoki Panic was released in Japan in 1987, while Super Mario Bros. 2 (the U.S. version) was released over a year later in October 1988. In that time, Nintendo made a few changes to the game. Some changes tied the game to the Mario series, while others were just general improvements. The four Dream Factory family members have been replaced with Mario characters. Imajin is replaced by Mario, Lina is replaced by Peach, Mama is replaced by Luigi and Papa is replaced by Toad. In Dokidoki Panic, your character moves at the same speed when moving. In Super Mario Bros. 2, you can hold down the B Button to dash, as you could in Super Mario Bros. Mask Blocks are replaced by Mushroom Blocks. You increase your life bar with Mushrooms, rather than Big Hearts (however, you still refill your life bar with small Hearts). When your character is down to one bar of life, they shrink. However, unlike in Super Mario Bros., enemies one sprite's height above the ground can still hit you, so the effect is purely visual. The characters stay the same height in Dokidoki Panic. In Dokidoki Panic, the 1-Up item is represented by your current character's face. In Super Mario Bros. 2, it becomes a 1-Up Mushroom. The mask that skims along the ground hurting enemies has been changed to a Koopa Shell. The music when you collect a Starman has been changed to the Super Mario Bros. Starman theme. Note that the Starman appears in both games (see cameos). The music when you enter subspace is now the Super Mario Bros. Ground Theme. Even though the game didn't start out as a Mario game, it still borrows a couple of items from the Mario series. POW Block from Mario Bros.
Starman from Super Mario Bros.